As the cost of college has sky-rocketed, students are accumulating more and more debt. You hear horror stories of student graduating with over $100,000, $150,000, or $200,000 in college debt just for an undergraduate education. And with tuition at some schools exceeding $60,000 a year, you have to wonder if that high student debt is simply the cost of attending college today? There are schools that have similar tuition but where students at one school graduate with significantly higher loan debts than those at the other. Obviously, you want to avoid schools where you are likely to end up with a substantial amount of college loan debt. In other words, start looking for colleges with lower debt loads if you want to minimize your college debt. The College Navigator website provides a summary of undergraduate student financial aid. 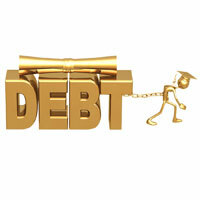 Under student loans, it lists the number and amount for federal loans and non-federal student loans. The amount of federal loans are capped to a total of $31,000 for undergraduates-that’s the total for all four years it takes to graduate. Students really shouldn’t be taking out any other loans than these. In fact, students usually only take out these non-federal loans after they have maxed out their federal loans for the year. They are in a situation where federal loans and grants and financial aid still won’t cover their expenses so they take additional loans. More than likely, these students will owe $31,000 in federal loans and are adding to the college debt with private loans. Don’t put yourself in this situation. Here’s how. According to the IPEDS data available in the DIY College Search Spreadsheet, the average percentage of freshman receiving non-federal student loans at public and private institutions with 500 or more full-time undergraduates was 7.7% for the 2013-14 school year. The average for public institutions was 4.7% and private colleges was 9.9%. The average amount of these loans was $11,165 just for the freshman year. Multiply that by four and add it to your federal loans you’ve more than doubled your student loan debt. There are 462 schools where 10 percent or more of the freshman have non-federal loans. Of course, some of these are much smaller amounts than $10,000. However, 305 of these schools have freshman with an average non-federal loan of $10,000 or greater. These schools deserve careful scrutiny. There’s a good chance that their calculation of your Expected Family Contribution won’t be the same as you had predicted. Or these schools tend to “gap” and not meet all the students expected need. Let’s take a look at Duquesne University. According to IPEDS in 2013-14, 19% of freshman received an average amount of $14,414 in non-federal loans. Remember, these loans are likely to only increase for the following years. Duquesne only met the full need of 19.4% of the freshmen identified with need according to the CollegeData website. On average, it met 76% of need for freshman, 73% for all undergraduates. Does this mean Duquesne is automatically a bad financial choice? No, of course not. It does mean that students should have other alternatives affordable alternatives if the financial aid doesn’t come through. There are at least 50 other private schools with between 4,000 and 8,000 undergraduates that have 10% or fewer freshman taking out non-federal loans. There are 33 private colleges in Pennsylvania and adjacent states that accept at least 70% of students and are at 10% or less for non-federal loans. There are at least 214 private colleges with similar 75th% ACT scores where 10% or fewer of freshman have non-federal loans. Given that more than half of all colleges have less than 10% of freshman taking out non-federal student loans, why would you start your college search at schools where 19% or 16% of freshman are taking out such loans? At the very least, make sure your list includes some schools as financial alternatives. There is one important thing to keep in mind-colleges aren’t going to fund your Expected Family Contribution (EFC). So a college that has a higher percentage of students with little to no demonstrated financial need, could be expected to have a high percentage of students taking out non-federal loans to cover the cost of attendance. That doesn’t mean this is a smart thing to do, it just means that this is a possible explanation. Finally, remember these are all averages. You may end up in the group that the school meets full demonstrated need, unlike the majority of the students at the school. The point is to go into the college search process with your eyes wide open. Decide how much your family can afford and be prepared to walk away from schools that would break your budget. There are always alternatives.